Dr. Fowler White and Dr. Keith Mathison join the Christ the Center panel to discuss eschatology and the varied millennial perspectives. Mathison’s new book From Age to Age is the focus of the discussion. There are some interesting exchanges on recaptiulation, Preterism, optimistic amillennialism and pessimistic postmillenialism. Mathison points to the differences in how premillennailists look at Revelation 19 & 20 compared to how amillennialists do. Though, personally, I’m in the premil camp, I found this discussion fascinating. I particularly enjoyed the consideration of prophecy requiring a look at the whole Bible, not just beginning with Revelation. 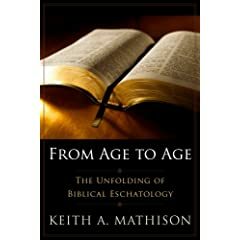 I’m looking forward to reading Mathison’s book which examines prophecy as a move beginning in Genesis.